Josef and Karel Capek's Insect Play, also known as The World We Live In, is based on the writings of J. Henri Fabre, a French entymologist (bug-studier) who based his studies on observation of insects in nature, rather than in a lab setting. His stories about caterpillars and wasps are filled with a childlike delight in discovery, and in his accounts, strong parallels between insect and human behavior appear. The Kapek brothers, fascinated by this idea, wrote a play which highlights those parallels. It is, like the insect world, both funny and reflective, tragic and triumphant, harsh and hilarious. The insect characters are litephorically larger-than-life, which is what gave me the idea to stage it as a giant puppet show, a la The Lion King. We may have a finger puppet or two, but most of what you'll see in our production are puppet creations that reflect those larger-than-life personalities. Kudos to the actors for their focus on and progress in vocal performance, and especially to the Production and Design class for their tireless work in developing these puppet creations! Enter Discount Code KAPEK at checkout for discounted tickets! 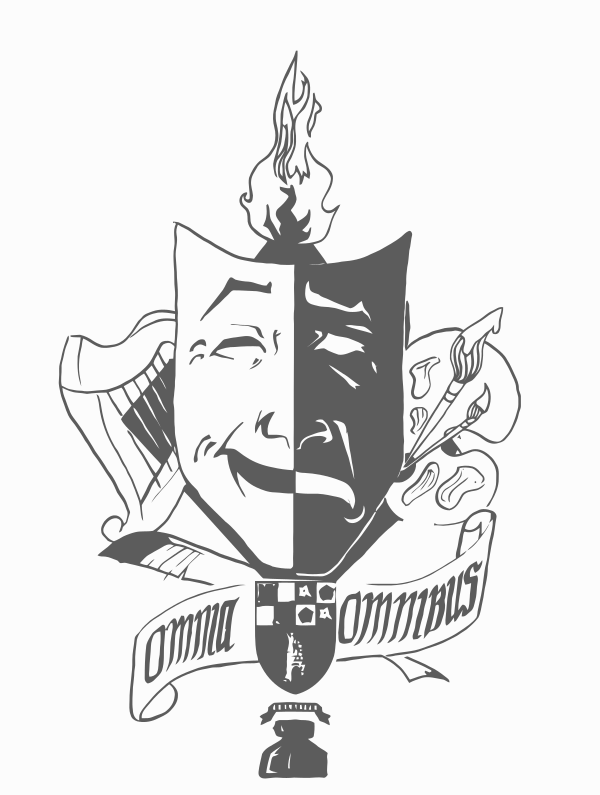 The different elements of the Omnibus Players' crest (seen above and here) symbolize the different elements of a theatrical production. The central mask represents the paradoxical union of joy and grief as essential aspects of the human experience. The mask also represents mysterious and hidden truth. The crest has written words as its base, just as plays are based on written language. “Omnia Omnibus,” or “All things to all men,” is St. Paul’s description of the Christian mission here on earth, and also an appropriate motto for an actor, who assumes many disguises in order to touch and inspire all audiences. The palette and the harp respectively represent the visual and the aural aspects of theater. The burning flame upon the top stands for the physical movement that enlivens each performance. The tongue of fire is also a symbol of the Holy Spirit, the Christian Muse, who inspires each artist with a true and loving vision of human life.